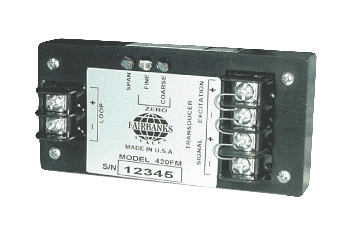 Fairbanks’ Load Cell Transmitter is ideal for customers who have tank or other types of scales but only require a 4-20 ma output. Common in many process control applications, the Load Cell Transmitter is also reffered to as a blind transmitter because there is no visual display, this device provides a very simple, low-cost alternative to installing an entire instrument on any scale where the only need is a 4-20 ma signal. Factory Mutual approval pending.